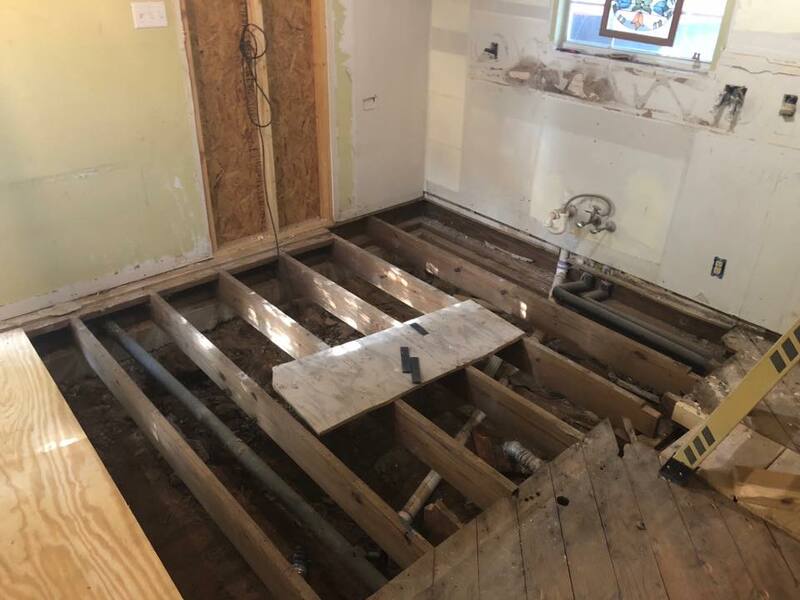 This project blog is a little different than our usual ones; there are no original floor plans, 3-D renderings for us to show, or backstory of the clients needing a larger floor plan or more storage. 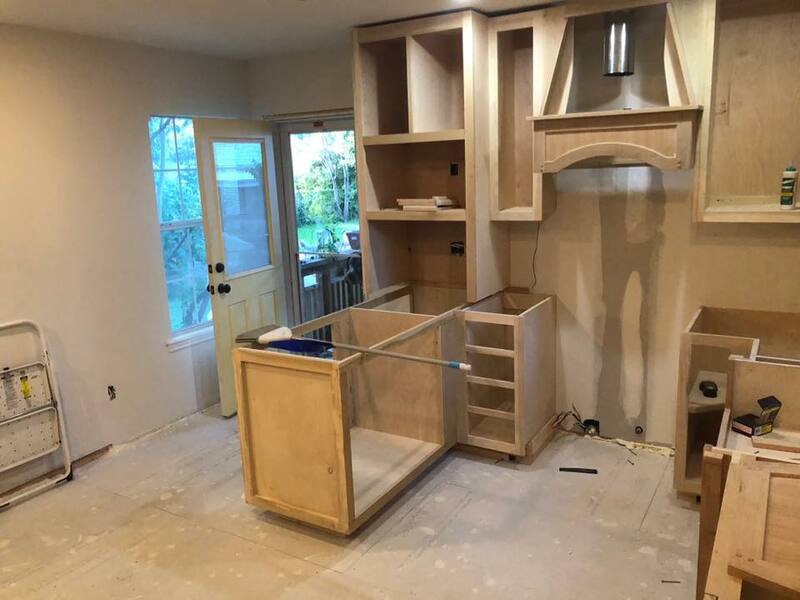 This kitchen remodel is the work of our very own Project Manager, Dave Broadfield, which he completed in his own home, on his own time, after hours of working in our client’s homes each day! We are blown away at his dedication and hard work to get this done without the assistance of our design team. The beautiful final result shows just how talented he is and the amount of detail he puts into his work. Because his home was built in 1938, it was important to Dave to stay true to the architecture of that era while still incorporating the modern feel of the 21st century. 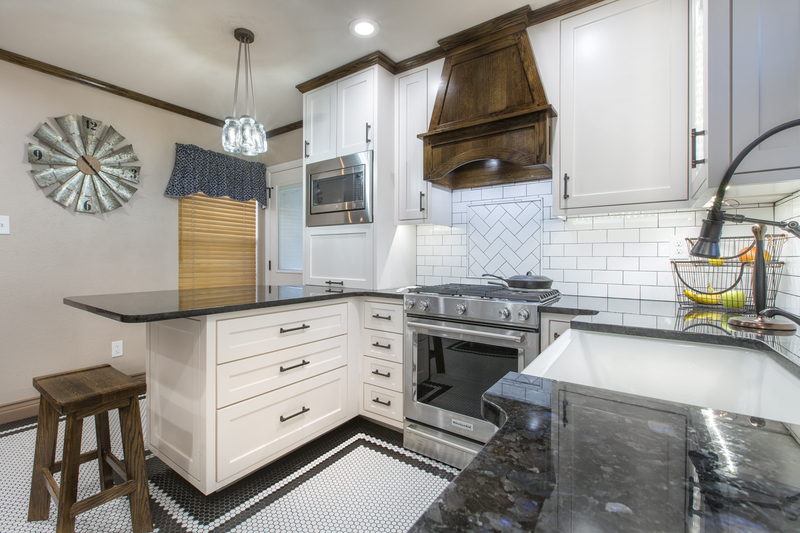 He chose a clean subway tile backsplash, dark granite counter tops, and wood accents to match the custom trim he stained. 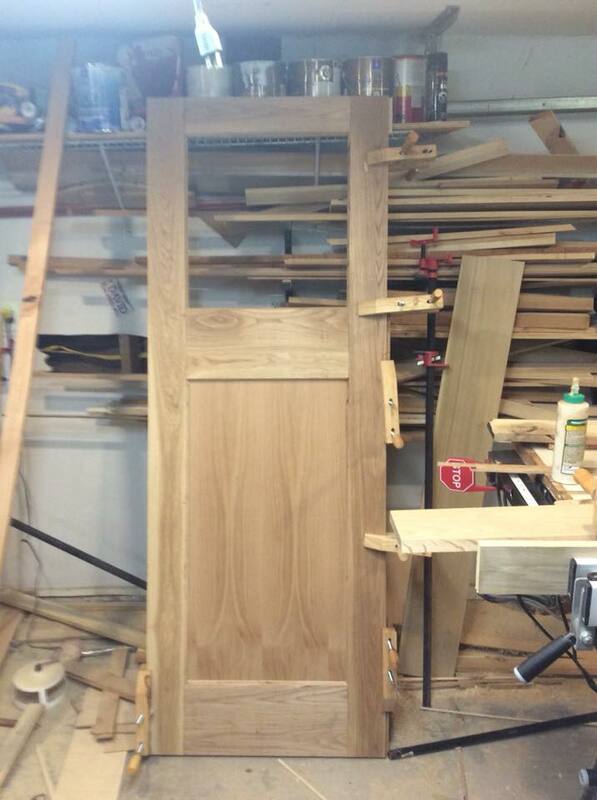 The shaker-style cabinets he built also contribute to a classic feel. 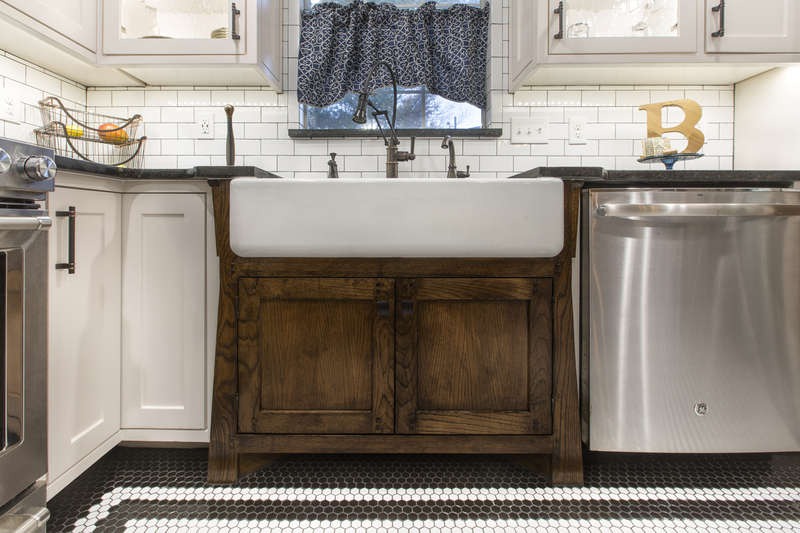 The farmhouse-style apron sink creates a timeless look, along with decorative glass-front upper cabinets backlit with LED lights. Strategically placed LED can lighting and under cabinet lights really brighten the room and countertop workspaces. The original kitchen was a bit longer, but it lacked the walk-in pantry that Dave and his wife both wanted. 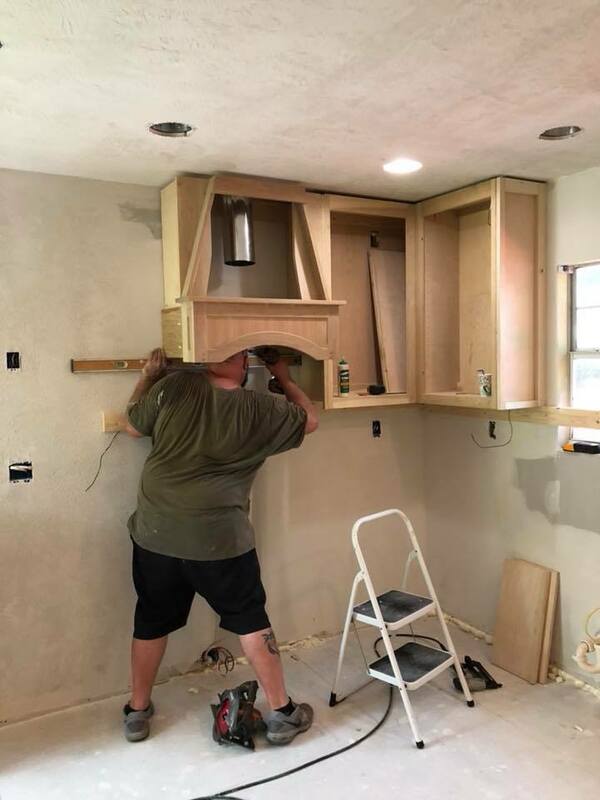 Dave decided it was worth it to use some of the square footage from the kitchen to build a pantry alongside his custom refrigerator cabinet. Adding a cabinet around the fridge created a sleek built-in look and also provided some additional cabinet storage on top. A cool and creative feature that Dave incorporated in the design is a sheet of metal on the side panel of the fridge cabinet – a perfect place to keep their magnet collection and post-it notes! The custom cabinets above the washer and dryer compliment the new modern look of the kitchen while also providing better storage space for laundry-related items. This area is also much brighter with an LED can light directly over the work area. We also wanted to mention this beautiful under-sink cabinet that Dave custom built out to look like a furniture piece. It fits so well with the style and color scheme of this kitchen! 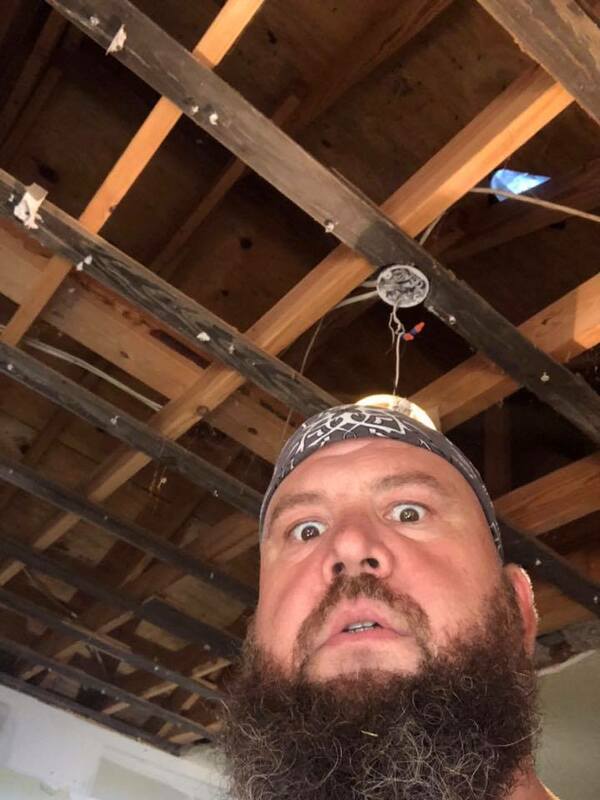 The flooring used is a black and white penny tile, which was another feature that Dave specifically chose to match the era of this home. You can’t tell in the photos, but the black portions of this tile came from the manufacturer about 1/16 to 1/8 inch smaller than the white portions, making it a real challenge to install it seamlessly! 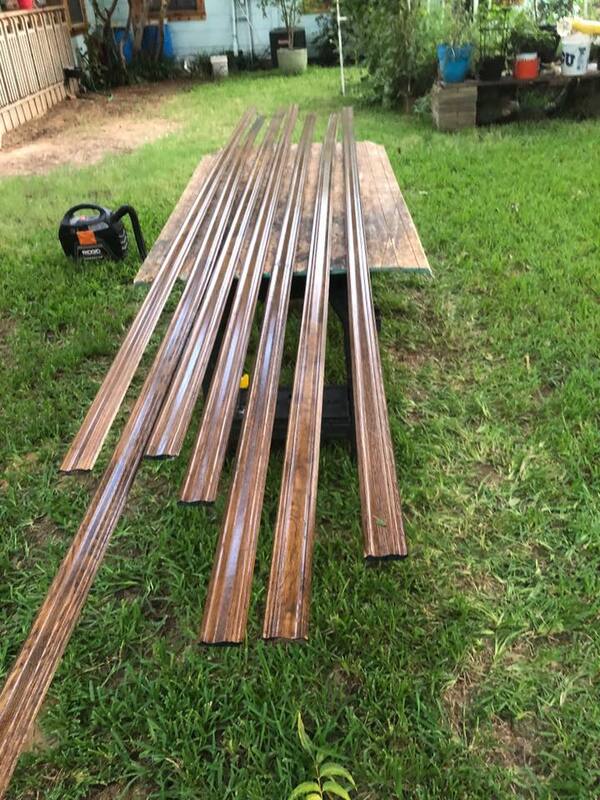 The black portion’s mats were cut individually and then spaced out a little further than they should have been to make up for the size difference. Talk about a timely commitment! The finished flooring was well worth the extra time and effort since this particular tile was difficult to find anywhere else. A new stainless-steel gas stove was installed with a beautiful wood hood vent. Dave included a large appliance garage and a built-in microwave above the new peninsula. 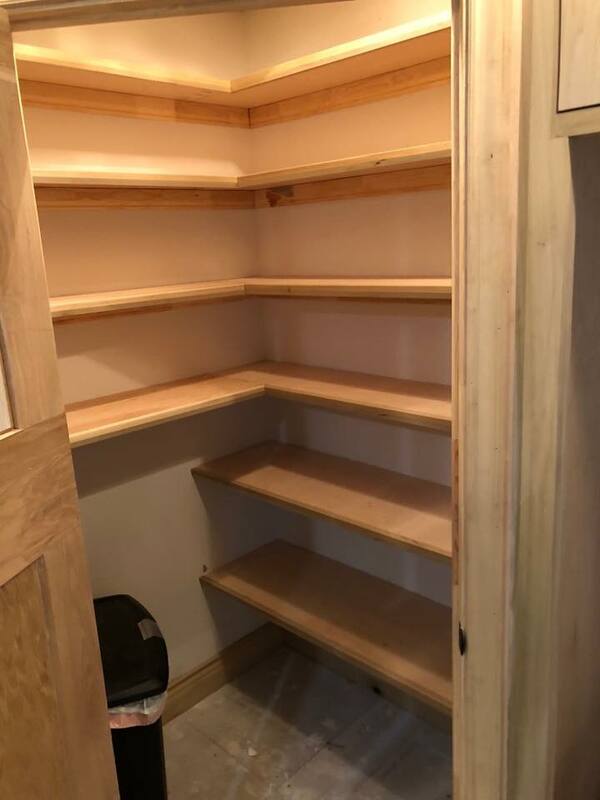 All the cabinets were extended to the ceiling with adjustable shelving inside for convenient storage. Below the peninsula are deep under-counter drawers, along with convenient stacked utensil drawers beside the stove. 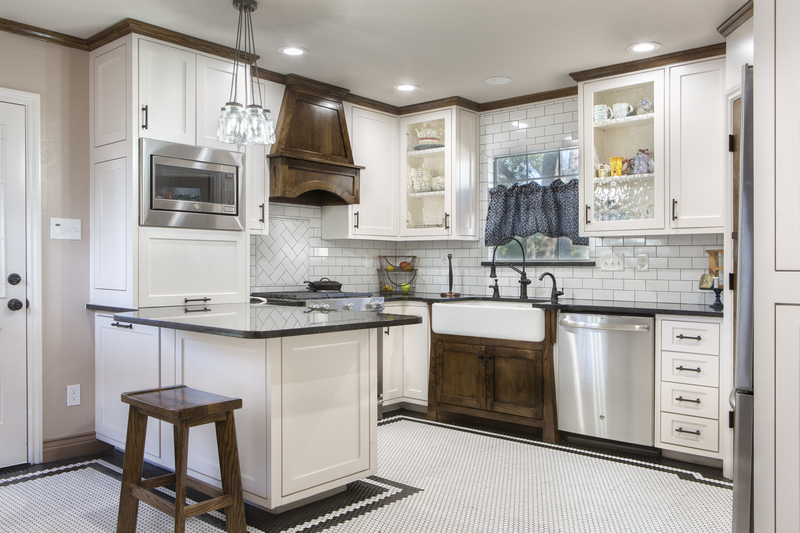 This set up is a great example of optimizing space in a small kitchen! The finished project is absolutely stunning; well worth the 2-3 years that Dave streamlined his ideas before getting started! 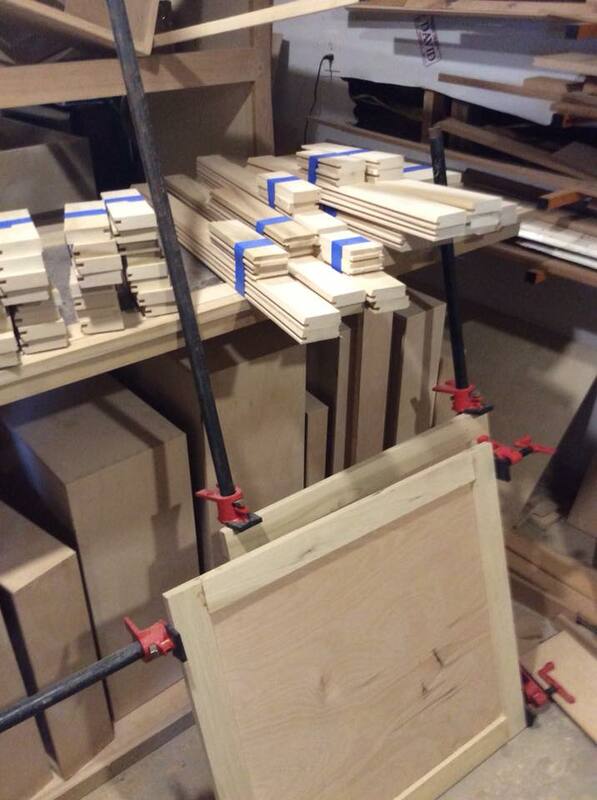 Needless to say, we are thankful to have such a talented, hard-working carpenter and Project Manager on our team. 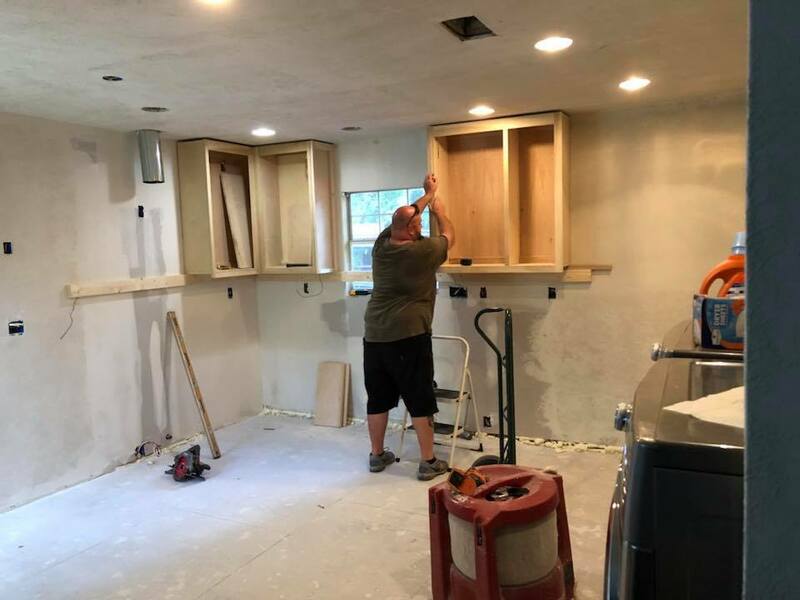 The work ethic he demonstrated to complete his own kitchen remodel is the same commitment he has for each and every one of our client’s jobs he works on. Just another point of pride for the Medford Team! If you are one of our current clients or have the pleasure to work with us and Dave in the future, be sure to compliment him on this fantastic project!